Turrets have their own story to tell. Seen as whimsical, elegant and historical, turrets that cap off different sections of homes and commercial structures make those projects a stand out success. Initially designed as small towers on medieval castles to provide vantage viewpoints to see oncoming enemies, today's turrets are much more decorative than functional. The circular tops on today's pointed roof turrets look like the final "cap" on a piece of architecture. 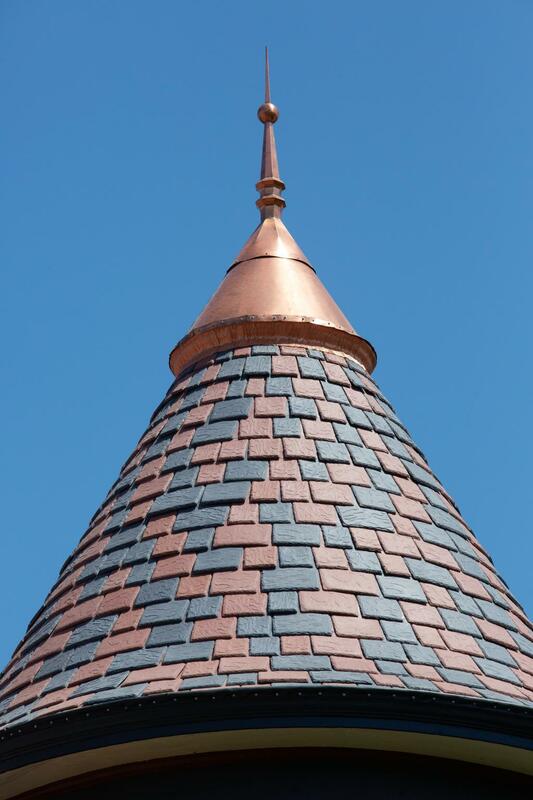 At DaVinci Roofscapes, we love to talk turrets (see Custom Colors, Turrets and Tiles… Oh My! and Turrets Are Easy With DaVinci’s Turret Package). Our talented team can create a custom engineered polymer roofing package for any turret. You provide us with four dimensions for the turret and we'll create a custom engineered turret package of composite roofing designed just for you that includes starter tiles and numbered field bundles custom engineered for each course. In Kansas, one homeowner was so in awe of how her DaVinci turret took shape on her designer roof that she snapped these pictures along the way. And, if you need more details to create your own luxury roof turrets with composite roofing products, click HERE to connect immediately to our turret package brochure!